Those who always found searching for pairs of baby animals, comic heroes or food rather tedious, can now look forward to plenty of variety and educational added value: MeterMorphosen is presenting The walls have ears – a memory game, the 44 non-identical pairs of which comprise of an incisive drawing by the award-winning illustrator Philip Waechter and a text card explaining the corresponding saying. Dictums are thus humurously illustrated with attention to detail, the respective explanation on the origin of the sayings can be found in the booklet provided. More communicative is hardly possible, which was also the verdict of the jury of the Promotional Gift Award 2017, so they – logically – distinguished the item in the category Communicative Products. The educational game is rounded off by a charming haptic, stackable packaging in which the tiles and wall joints are embedded. The house lies nicely in the hand and is extremely stable. 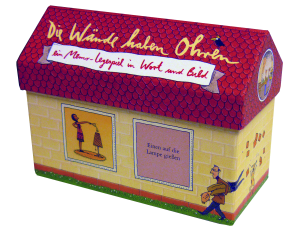 In the case of smaller order quantities the items are customised with a sticker, for volumes of 1,000 pieces upwards a logo can be placed on the roof; for orders of 3,000 pieces upwards, the customer can choose his own pair of cards for the game. Then, Philip Waechter illustrates a saying that best reflects the industry the customer is from.